EAST HANOVER, N.J., Feb. 26, 2016 /PRNewswire/ -- Novartis today announced that the United States Food and Drug Administration (FDA) approved Afinitor® (everolimus) tablets for the treatment of adult patients with progressive, well-differentiated, nonfunctional neuroendocrine tumors (NET) of gastrointestinal (GI) or lung origin that are unresectable, locally advanced or metastatic. Afinitor received a priority review designation providing a shortened review period for drugs that treat serious conditions and offer a significant improvement in safety or effectiveness. "Afinitor is the first treatment approved for progressive, nonfunctional NET of lung origin, and one of very few options available for progressive, nonfunctional GI NET, representing a shift in the treatment paradigm for these cancers," said Bruno Strigini, President, Novartis Oncology. "We are proud of our Afinitor development program, which has translated to meaningful benefits for patients with several different cancers and rare diseases." 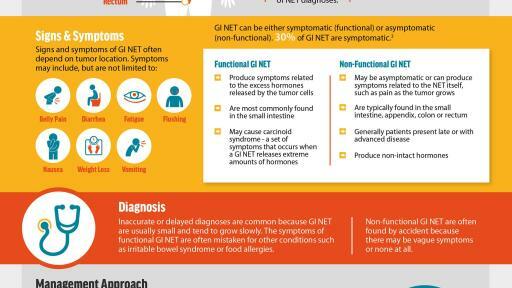 Neuroendocrine tumors are a rare type of cancer that originate in neuroendocrine cells throughout the body, and are most often found in the GI tract, lungs or pancreas1,4. NET can be defined as functional or nonfunctional. Functional NET are characterized by symptoms caused by the oversecretion of hormones and other substances. 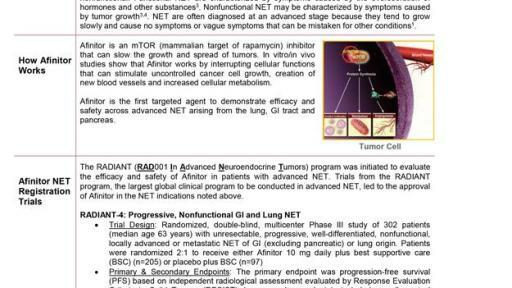 Nonfunctional NET may be characterized by symptoms caused by tumor growth, such as intestinal obstruction, pain and bleeding for GI NET, and asthma, chronic obstructive pulmonary disease and pneumonia for lung NET5,6,7,8. 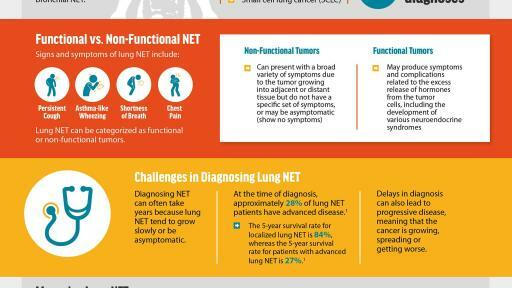 More than 70% of patients with NET have nonfunctional tumors9. 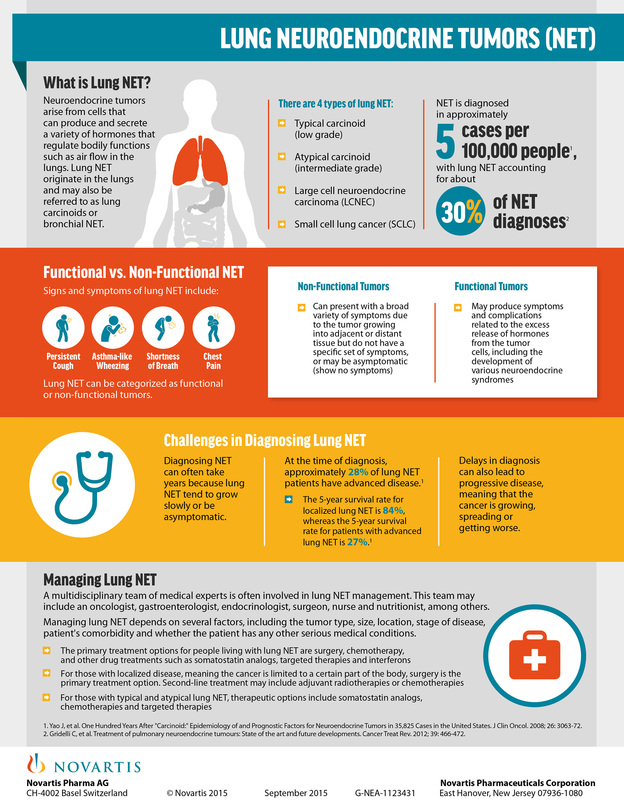 At the time of diagnosis, 5%-44% (depending on site of tumor origin) of patients with NET in the GI tract and 28% of patients with lung NET have advanced disease, meaning the cancer has spread to other areas of the body, making it difficult to treat1,4. Progression, or the continued growth or spread of the tumor, is typically associated with poor outcomes10. The approval of Afinitor was based on efficacy and safety data from a pivotal study (RADIANT-4) showing Afinitor reduced the risk of progression in patients with progressive, well-differentiated, nonfunctional NET of GI or lung origin by 52% (hazard ratio [HR] = 0.48; 95% confidence interval [CI], 0.35-0.67; p<0.001) vs placebo. Additionally, the data showed Afinitor increased median progression-free survival (PFS) by 7.1 months: median PFS by central review was 11.0 months (95% CI, 9.2-13.3) in the Afinitor arm and 3.9 months (95% CI, 3.6-7.4) in the placebo arm3. In the pivotal trial, the most common treatment-related grade 3/4 adverse events (AEs) (≥5%) for Afinitor and placebo, respectively, were infections (11.0% vs 2.0%), diarrhea (9.0% vs 2.0%), stomatitis (9.0% vs 0.0%), fatigue (5.0% vs 1.0%) and hyperglycemia (5.0% vs 0.0%)3. Additional worldwide regulatory filings for this indication are underway, with a decision in the EU anticipated in 2016. 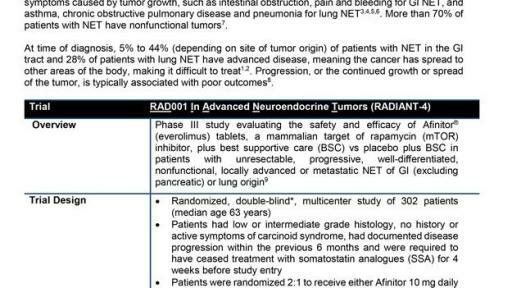 RADIANT-4 (RAD001 In Advanced Neuroendocrine Tumors) is a Phase III prospective, double-blind, randomized, parallel group, placebo-controlled, multicenter study. It examined the efficacy and safety of Afinitor plus best supportive care (BSC) vs placebo plus BSC in 302 patients with unresectable, progressive, well-differentiated, nonfunctional, locally advanced or metastatic NET of GI (excluding pancreatic) or lung origin. The major efficacy outcome measure of RADIANT-4 was PFS based on independent radiological assessment evaluated by Response Evaluation Criteria in Solid Tumors. Additional efficacy outcome measures were overall survival and best overall response rate (defined as complete response plus partial response)3. Patients were randomized 2:1 to receive daily Afinitor 10 mg or daily placebo orally. All patients received BSC during treatment, which excluded somatostatin analogues (SSAs). Patients had low or intermediate grade histology, no history or active symptoms of carcinoid syndrome, had documented disease progression within the previous 6 months and were required to have ceased treatment with SSAs for 4 weeks before study entry3,11. The safety profile of Afinitor was consistent with what has been observed in previous studies of this drug. The most common treatment-related, all-grade AEs (incidence ≥30%) were stomatitis (63%), infections (58%), diarrhea (41%), peripheral edema (39%), fatigue (37%) and rash (30%). Afinitor was discontinued for adverse reactions in 29% of patients and dose reduction or delay was required in 70% of Afinitor-treated patients3. 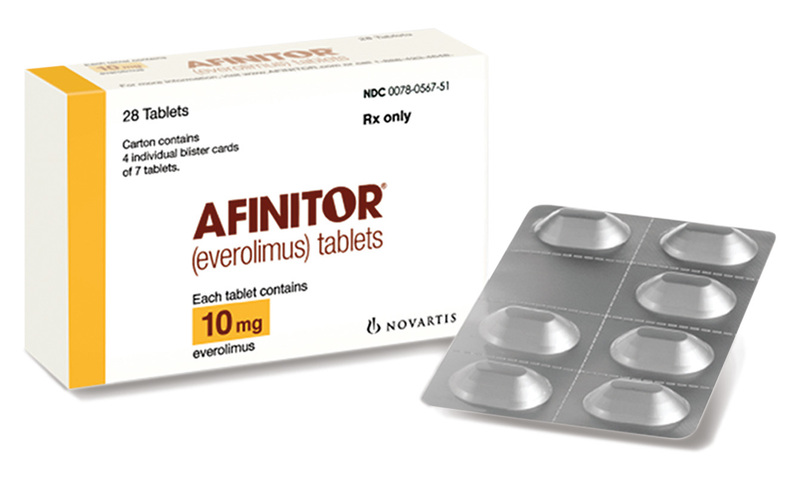 Afinitor is a prescription medicine used to treat adults with a type of cancer known as neuroendocrine tumor (NET) of the stomach and intestine (gastrointestinal) or the lung that has progressed and cannot be treated with surgery. Afinitor is not for use in people with carcinoid tumors that actively produce hormones. Novartis is committed to helping patients access our medications by offering comprehensive support programs, including Patient Assistance Now Oncology (PANO) and Afinitor CoPay programs. For more information on eligibility for these programs and how to sign up, patients and providers can visit www.Afinitor.com. Afinitor can cause serious side effects, including lung or breathing problems, infections, and kidney failure, which can even lead to death. If patients experience these side effects, they may need to stop taking Afinitor for a while or use a lower dose. Patients should follow their health care provider's instructions. Afinitor may make patients more likely to develop an infection, such as pneumonia, or a bacterial, fungal, or viral infection. Viral infections may include reactivation of hepatitis B in people who have had hepatitis B in the past. In some people these infections may be severe and can even lead to death. Patients may need to be treated as soon as possible. Patients should tell their health care provider right away if they have a temperature of 100.5˚F or above, chills, or do not feel well. Symptoms of hepatitis B or infection may include the following: fever, chills, skin rash, joint pain and inflammation, tiredness, loss of appetite, nausea, pale stools or dark urine, yellowing of the skin, or pain in the upper right side of the stomach. Patients who take an angiotensin-converting enzyme (ACE) inhibitor medicine during treatment with Afinitor are at a possible increased risk for a type of allergic reaction called angioedema. Patients should get medical help right away if they have trouble breathing or develop swelling of the tongue, mouth, or throat during treatment with Afinitor. Afinitor can cause incisions to heal slowly or not heal well. Patients should tell their health care provider if their incision is red, warm, or painful; if they have blood, fluid, or pus in their incision; or if their incision opens up or is swollen. Common side effects include mouth ulcers and sores. Other common side effects include infections, diarrhea, swelling of the arms, hands, feet, ankles, or other parts of the body, feeling weak or tired, rash, dry skin, itching, cough, shortness of breath, nausea, fever, weight loss, or loss of appetite. The foregoing release contains forward-looking statements that can be identified by words such as "underway," "anticipated," "can," "may," or similar terms, or by express or implied discussions regarding potential new indications or labeling for Afinitor (everolimus), or regarding potential future revenues from Afinitor. You should not place undue reliance on these statements. Such forward-looking statements are based on the current beliefs and expectations of management regarding future events, and are subject to significant known and unknown risks and uncertainties. Should one or more of these risks or uncertainties materialize, or should underlying assumptions prove incorrect, actual results may vary materially from those set forth in the forward-looking statements. There can be no guarantee that Afinitor will be submitted or approved for any additional indications or labeling in any market, or at any particular time. Nor can there be any guarantee that Afinitor will be commercially successful in the future. In particular, management's expectations regarding Afinitor could be affected by, among other things, the uncertainties inherent in research and development, including unexpected clinical trial results and additional analysis of existing clinical data; unexpected regulatory actions or delays or government regulation generally; the company's ability to obtain or maintain proprietary intellectual property protection; general economic and industry conditions; global trends toward health care cost containment, including ongoing pricing pressures; unexpected safety issues; unexpected manufacturing or quality issues, and other risks and factors referred to in Novartis AG's current Form 20-F on file with the US Securities and Exchange Commission. Novartis is providing the information in this press release as of this date and does not undertake any obligation to update any forward-looking statements contained in this press release as a result of new information, future events or otherwise. Located in East Hanover, New Jersey, Novartis Pharmaceuticals Corporation is an affiliate of Novartis AG, which provides innovative healthcare solutions that address the evolving needs of patients and societies. Headquartered in Basel, Switzerland, Novartis offers a diversified portfolio to best meet these needs: innovative medicines, eye care and cost-saving generic pharmaceuticals. Novartis is the only global company with leading positions in these areas. In 2015, the Group achieved net sales of USD 49.4 billion, while R&D throughout the Group amounted to approximately USD 8.9 billion (USD 8.7 billion excluding impairment and amortization charges). Novartis Group companies employ approximately 119,000 full-time-equivalent associates. Novartis products are available in more than 180 countries around the world. For more information, please visit http://www.novartis.com. * The brands listed are the trademarks or register marks of their respective owners and are not trademarks or register marks of Novartis. 1. American Cancer Society. Gastrointestinal Carcinoid Tumors. 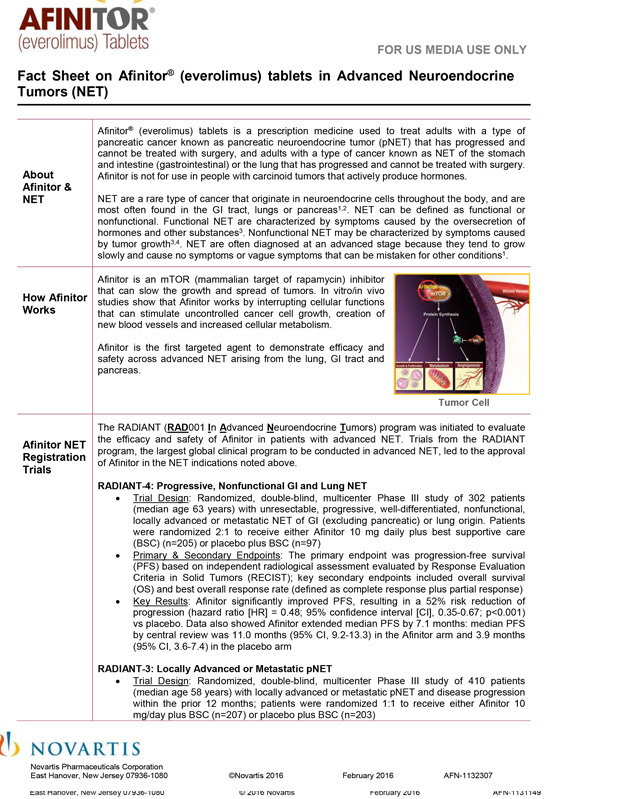 Available at http://www.cancer.org/acs/groups/cid/documents/webcontent/003102-pdf.pdf. Accessed February 2016. 2. American Cancer Society. Lung Carcinoid Tumors. Available at http://www.cancer.org/acs/groups/cid/documents/webcontent/003117-pdf.pdf. Accessed February 2016. 3. 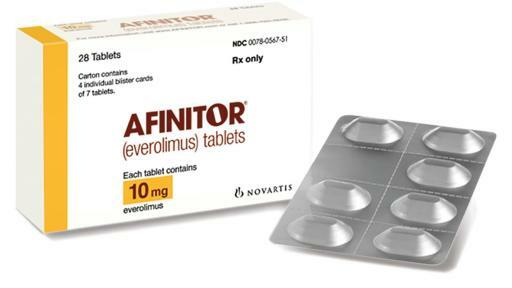 Afinitor (everolimus) Prescribing information. East Hanover, New Jersey, USA: Novartis Pharmaceuticals Corporation; February 2016. 4. Yao J, et al. One hundred years after "Carcinoid:" Epidemiology of and prognostic factors for neuroendocrine tumors in 35,825 cases in the United States. J Clin Oncol. 2008; 26: 3063-72. 5. Öberg K, et al. 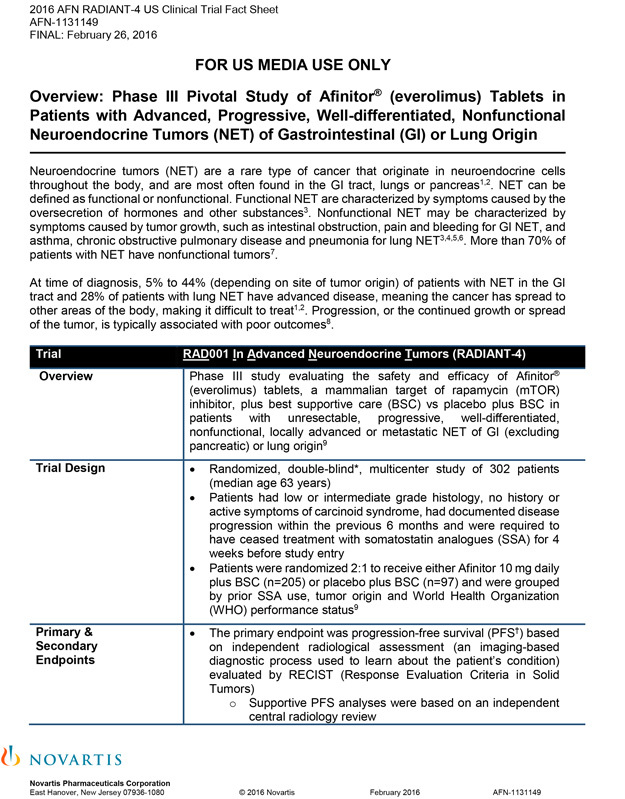 Gastrointestinal neuroendocrine tumors. Annals of Oncology. 2010; 21: vii72–vii80. 6. Modlin I, et al. 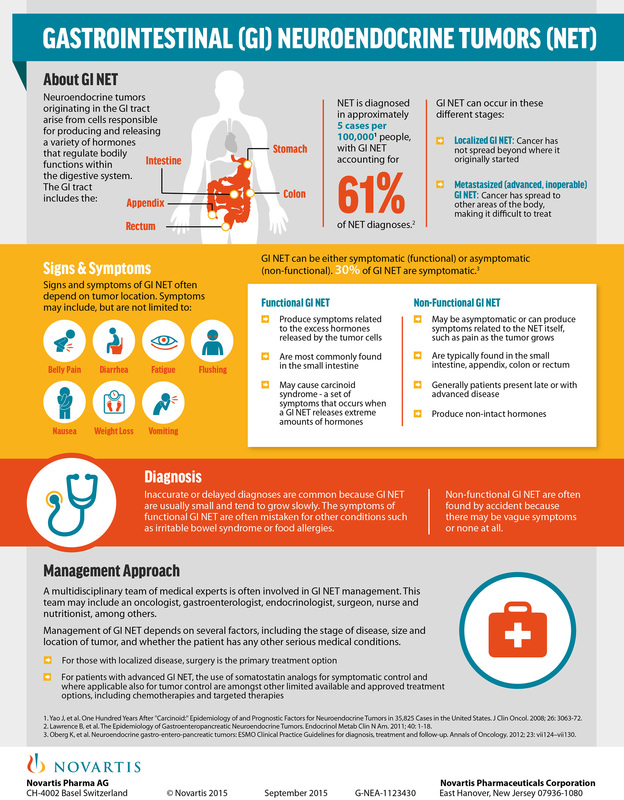 Priorities for improving the management of gastroenteropancreatic neuroendocrine tumors. J Natl Cancer Inst. 2008; 100: 1282-1289. 7. Modlin I, et al. Current status of gastrointestinal carcinoids. Gastroenterology. 2005; 128: 1717-1751. 8. Wolin EM. Challenges in the diagnosis and management of well-differentiated neuroendocrine tumors of the lung (typical and atypical carcinoid): Current status and future considerations. The Oncologist. 2015; 20:1123-1131. 9. Choti, M.A., et al. Prevalence of functional tumors in neuroendocrine carcinoma: An analysis from the National Comprehensive Cancer Network Neuroendocrine Tumors database. The North American Neuroendocrine Tumor Society (NANETS) Symposium. October 2012, San Diego, US. 10. National Cancer Institute. “NCI Dictionary of Cancer Terms.” Available at http://www.cancer.gov/publications/dictionaries/cancer-terms. Accessed February 2016. 11. Yao J, et al. Everolimus for the treatment of advanced, non-functional neuroendocrine tumours of the lung or gastrointestinal tract (RADIANT-4): a randomised, placebo-controlled, phase 3 study. The Lancet. Available at http://www.thelancet.com/journals/lancet/article/PIIS0140-6736(15)00817-X/fulltext. Accessed February 2016.